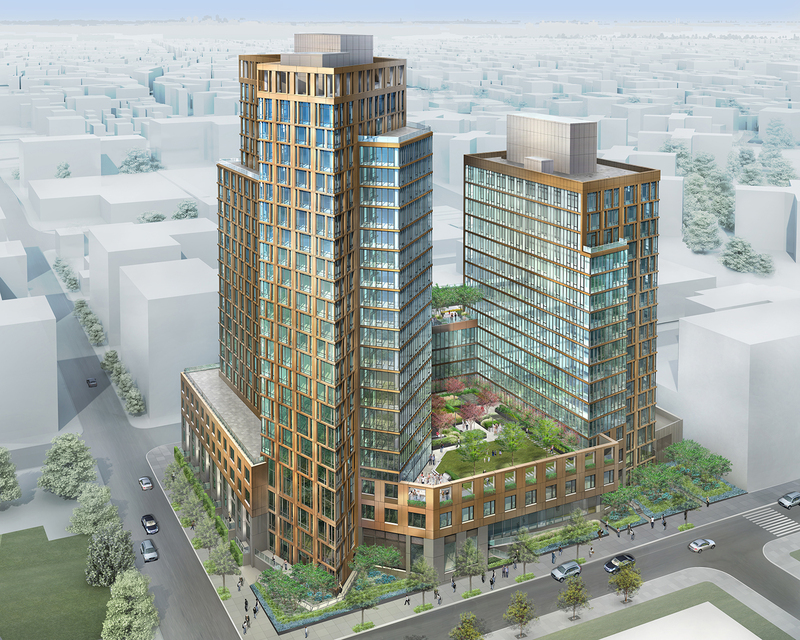 The Hallets Point project in Astoria, Queens, is back on track after Governor Cuomo secured approval of the Affordable New York program earlier this month. The scheme is essentially a replacement for the “421-a” initiative which had been in place for 50 years and encouraged city developers to build more affordable homes incentivized through tax breaks. Backed by the Durst Organization, the project began construction at the start of 2016, though this stopped just a day later as the 421-a program came to a close, meaning that the developers could not afford to continue the project. It was due to cost $1.5 billion and cover 2.4 million square feet. Subsequently, it had been reported that Durst had drastically curtailed their plans for the site: A project that once promised seven buildings housing 1,917 market-rate dwellings and a further 483 affordable units along with a supermarket, school, and waterfront esplanade had been reduced to one building boasting a measly 163 units—all of which had been paid for before 421-a ended. However, Durst spokesperson Jordan Barowitz told The Architect's Newspaper that the plan was "never scaled back." "We just said that if 421-a wasn’t in place we couldn’t move forward, it's the same plan," he said. Barowitz also added that if Cuomo's Affordable New York act hadn't gone through, Durst would have been forced to scuttle affordable housing on the other projects such as 1800 Park Avenue (which is still in the design phase) and the Queens Plaza Park scheme in Long Island City. However, Hallets Point—designed by two New York firms Dattner Architects and Studio V—is good to go again. "We're very pleased we’ll be able to move forward with the project and help revitalize the Hallets community and create a bunch of jobs and hundreds of units of affordable housing," Barowitz, told DNAinfo. Hallets Point will transform the now isolated stretch of the Queens waterfront into a thriving residential community with a supermarket, a vibrant mix of retail, an extended and enhanced esplanade, parklands and renovated playgrounds. The project also includes community use facilities, a site for the construction of a new K-8 public school and an additional development lot for the New York City Housing Authority. The first building to be constructed on the site will provide 405 residential units and a supermarket. It is scheduled to open in Spring next year. Jersey City, New Jersey—where tall towers have popped up with some regularity for the past decade—is about to get another huge waterside development by Studio V and the landscape architects at Michael Van Valkenburgh. Private equity firm Quadrum Global is planning a 2,150-unit complex that includes 50,000 square feet of retail and a new public park for a now-vacant parcel (though a representative for Quadrum reached out to The Architect's Newspaper on January 23 to say the unit count "might change"). One available rendering of the development, called Crescent Park, depicts glassy 12-story towers curving around a lush park and waterway. Just east of I-78 on the banks of Mill Creek Outfall, a Hudson River tributary, the development is roughly parallel with lower Manhattan's Financial District. Future residents will live within walking distance of ferry service to Manhattan and the Hudson-Bergen light rail line. Jersey Digs reports that Quadrum's partner, developer Argent Ventures (doing business as Johnston View), bought the 7.5-acre property, which is part of the Grand Jersey Redevelopment Area, for close to $35 million in April 2015. Crescent Park could break ground as early as next year, documents show. Plans call for a cleanup of the creek in addition to the new construction, though the Jersey City Planning Board has yet to approve the project. This article appears on HoverPin, a new app that lets you build personalized maps of geo-related online content based on your interests: architecture, food, culture, fitness, and more. Never miss The Architect's Newspaper's coverage of your city and discover new, exciting projects wherever you go! See our HoverPin layer here and download the app from the Apple Store. 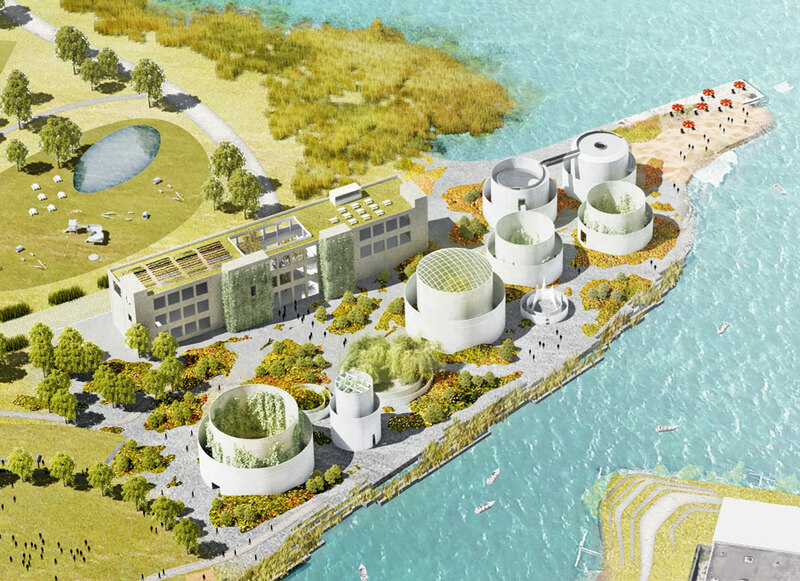 The development team behind Maker Park has released new renderings for an inventive green space that grows from industrial relics on the Brooklyn waterfront. With this design, and last week's announcement that the city will buy a critical strip of vacant land to complete a large riverside park, it seems the wheels are finally starting to turn on the waterfront's conversion to parkland, a process that began in response to a 2005 Williamsburg-Greenpoint rezoning that produced more luxury condos than public space. Maker Park—which its creators stress is in its ideas stage—adapts the infrastructure on an isolated slice of the East River into performance venues, gardens, and open space, an adventure playground writ large for longtime residents and visitors alike. The idea, its creators say, honors the neighborhood's creative types through a guiding ethos of exploration influenced by the city's maker scene, a technology-infused offshoot of DIY culture that stresses interdisciplinary collaboration. The park is one vision for a waterfront green space that is more than a decade in the making. Last week the city announced a deal that brings a park—Maker Park, a competing vision, or a blend of stakeholders' ideas—one step closer to completion. City officials say $160 million will be spent to acquire the last remaining parcel in a necklace of city-owned land that runs along Kent Avenue from North 14th to North 9th streets (a seven-acre state park occupies two blocks to the south on the same strip). The Maker Park vision for that 27-acre expanse—which is officially called Bushwick Inlet Park—has precedent in the citizen-led efforts that gave birth to the High Line and now spur parks like the QueensWay. A grassroots team led by three young New Yorkers—Zac Waldman, who works in advertising, Karen Zabarsky, the creative director at Kushner Companies, and Stacey Anderson, director of public programs at the Municipal Arts Society (MAS)—has partnered with a team of architects and designers to reimagine the city-owned site's otherworldly white fuel containers, the remnants of Bayside Fuel Oil Depot, as galleries, stages, reflecting pools, art galleries, and hanging gardens. In collaboration with New York–based firms STUDIO V Architecture and Ken Smith Workshop, the group officially unveiled its vision for the ruins in May. 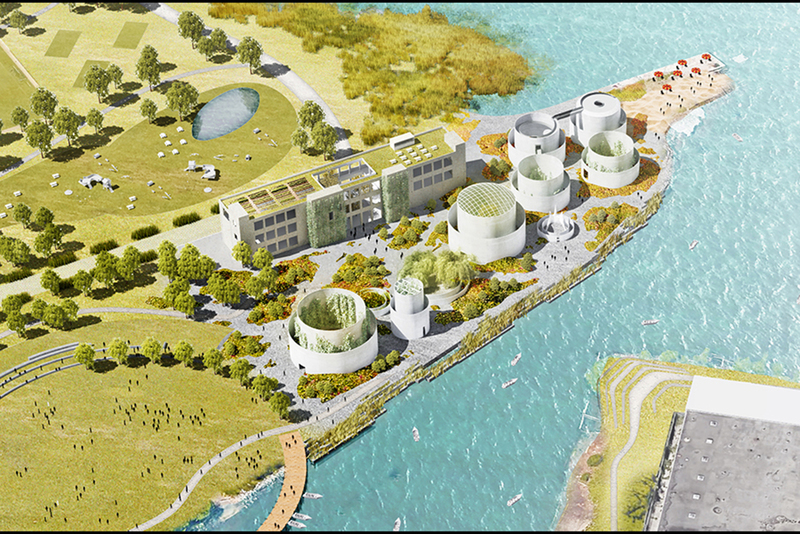 In the renderings, Maker Park would stretch from Bushwick Inlet (at North 14th Street and Kent Avenue) south to North 12th Street, right across the street from present-day Bushwick Inlet Park. "Most of the developments on the Williamsburg-Greenpoint waterfront have made it anonymous," said Jay Valgora, founding principal of STUDIO V. "Much of the waterfront is kind of generic, and that's a shame, because the neighborhood is not. We think the park has to be as special as the community it's going to support." Initial renderings deliver on that promise. In dialogue with the cylindrical oil storage tanks, a curved boardwalk sweeps visitors over the inlet and back to shore in a terraced open lawn. The inlet would be planted with native grasses to create a wetland—and natural flood barrier, and a former Bayside building that fronts North 12th Street could be converted to green-roofed galleries or an events space. Maker Park's do-it-yourself ethos isn't meant to override community input. "These renderings are meant to inspire, not to prescribe," said Zabarsky. "The reason they're so magical and have these different elements is to bring about new ideas." Anderson added that community stakeholders have worked with the city for more than ten years to realize the park and that "this is alternate design vision for one portion of the park" grounded architecturally in adaptive reuse. Though they have detailed renderings and site plans, the team says their ideas are a stake in the ground—it is up to the neighborhood, the New York City Department of Parks and Recreation, and other agencies to conceive and execute a final plan. To that end, Maker Park is hosting a design exhibition in Greenpoint next week to solicit ideas from neighbors on how to develop the designs moving forward (more information on the event can be found here). The group has drafted ten guiding principles—centered on transparency, public input, and the preservation of open space along the river—to follow in its work. The street-facing green space adheres to the Parks Department's Parks Without Borders, a new initiative that opens up the edge conditions of the city's many gated parks, while a soccer field on the southern edge mirrors an adjacent space in Bushwick Inlet Park. Despite their ambition, the plans should work "within a typical park budget," said Valgora, but it's ultimately up to the city to allocate funds. One component that could cost more is the reuse of the Bayside building, though he said Maker Park is doing a financial feasibility analysis right now to get a clearer idea of those costs. Outside the group, the conservation of the industrial heritage is anathema to the neighborhood's progress and public image. Friends of Bushwick Inlet Park (FBIP), an advocacy group instrumental in the creation of its namesake green space, have been vocal in their distaste for the "glorification of oil tanks." It sees Maker Park as a spiteful gesture to a community that has borne a disproportionate share of environmental hazards over the course of the city's industrial history. Not surprisingly, FBIP supports the city's open space master plan, which does not include plans to preserve the fuel tanks. The Maker Park team is keenly aware of the site's environmental challenges. One guiding principal is the safe remediation of the site's environmental hazards, and the group has recruited landscape experts to develop a mitigation strategy. The contamination on site is not unusual for waterfront development in New York, said Michael Bogin, environmental lawyer and principal at Sive, Paget & Riesel P.C. There are other ways to contain toxins—recovery wells, barrier walls, and clean-fill—besides destroying the infrastructure to ensure that mobile contaminants do not escape from the soil or water. "If you take the tanks down, then put in two feet of clean-fill material, then all you've really done is destroyed the architectural value of those tanks. You haven't created a different remedy." Landscape is crucial to the remediation strategy. Ken Smith, founding principal of Ken Smith Workshop, said that the sculpted topography of the site would be built on two to three feet of clean-fill material. Capping the site, which itself is a hundred-year-old landfill, also raises it out of "high frequency" floodzones, he said. Wetlands, planted with native grasses, would be accessible via the boardwalk and cross-hatched waterside beds, and the great lawn, a counterpoint to the contextual native flora, is encircled by trees and could host large events. Both men signed onto the pro bono project to secure the city's ever-threatened manufacturing legacy. "The East River is the heart of the city, the focal point of 21st-century New York City," Bogin said. He has worked for clients who, in his view, have degraded the historic quality of the waterfront or blocked access to the shore. "We're losing the history of the river. I don't want Brooklyn's waterfront to become Times Square. Let's save something." This is the eighth in a series of guests posts that feature Archtober Building of the Day tours! Today’s very wet Building of the Day tour brought us up to the Bronx where Jay Valgora, AIA, of Studio V Architecture, described the ongoing construction and design of the Bronx Post Office. The post office was originally constructed in 1937 on the Grand Concourse, a thoroughfare that helped to develop the Bronx into the dense urban area it is today. The post office is, as Valgora told us, classical, yet also modern in its style. The structure occupies an entire city block, its symmetrical entrances are framed with white marble that features very fine, precise edges. Despite its enormous size, only the front lobby was accessible to the public, as the rest of the post office was used for postal functions. 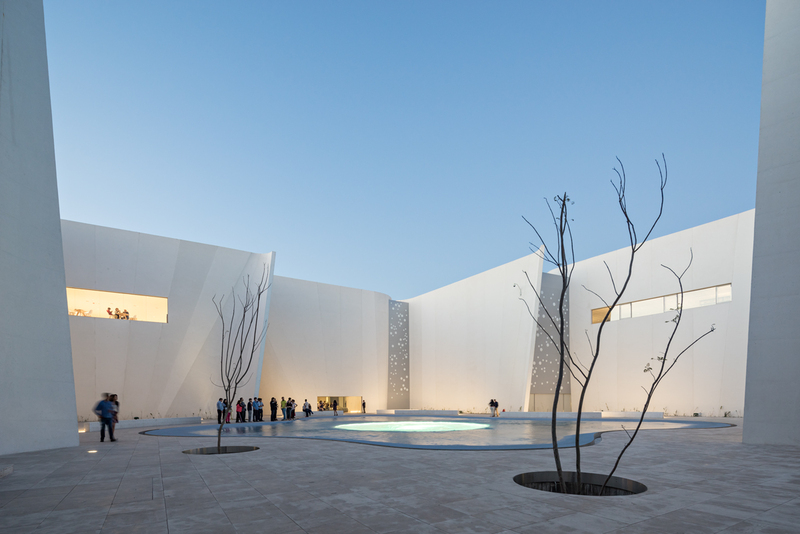 When the post office was sold in 2014 and Studio V brought in to give the building new life, Valgora found himself facing numerous challenges from various fronts. Firstly, the building and the interior of the lobby are both New York City landmarks and on the National Register of Historic Places. This meant that he had to work closely with the Landmarks Commission to have every change approved. Additionally, local leaders wanted to ensure that the new building served the needs of the community, which meant keeping a portion of the building as a working post office. Studio V has totally restored the landmarked lobby, with the goal of making it completely accessible to the public once again. Murals painted by Ben Shahn during the Works Progress Administration-era are being restored to their original 1930s brilliance. Studio V plans to build a supermarket in the basement and turn the ground floor into a marketplace for different foodstuffs. Valgora explained that this was important for the area as the post office is in one of New York City’s “food deserts” and the addition of a grocery store will greatly help the local population. The second floor will be classroom spaces for Hostos Community College, located right down the street. The third floor will be turned into small, leasable commercial spaces for small businesses. The local community board and Bronx Borough President Ruben Diaz, Jr. hope that this space will help in the ongoing resurgence of the Bronx. Studio V plans to add another space on the roof of the post office, which will serve as a restaurant space and open garden. The firm decided to use polycarbonate for this new floor because Valgora did not want the new space to completely imitate the original brick and marble. To that extent, Valgora believes the polycarbonate will serve to complement the original building materials. The restaurant will have glass walls, giving patrons a full view of the Bronx’s skyline. Behind the building, the post office’s original loading dock will serve as the new main entrance to the marketplace on the ground floor. This area is very industrial in character and Studio V decided to use a mesh ceiling in this area as a complement to the original look of this part of the structure. 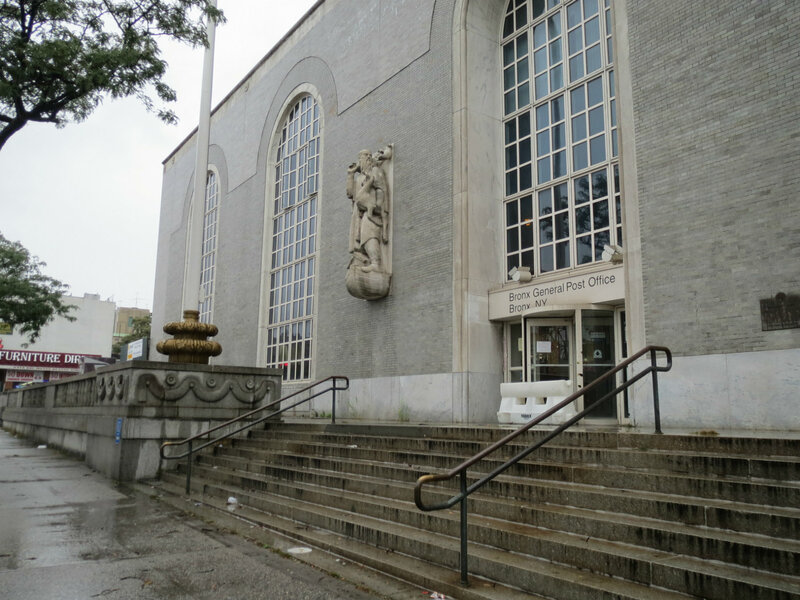 Overall, the Bronx Post Office will integrate itself seamlessly into the area while offering new services crucial for a 21st-century neighborhood. Tomorrow, we venture to the original World Trade Center of New York City: Schermerhorn Row at the South Street Seaport! About the author: Jacob Fredi is the Public Programs and Exhibitions Coordinator at the Center for Architecture. When he’s not on Building of the Day tours, you can find him playing board games (Carcassonne!) and brewing his own beer. Over the weekend, AN joined Open House New York on a tour of the under-construction Empire Stores warehouse in Dumbo, Brooklyn. The old coffee bean warehouse was built in the 1870s, but has been sitting empty along the East River for decades. By next fall, though, the Empire Stores will have been transformed with all the Brooklyn-type fixings you'd expect. Yes, there is an artisanal Brooklyn market featuring local purveyors. And office space for tech and creative companies. And cafes, restaurants, and beer gardens. Included in the mix is also a rooftop public park and a museum focused on New York City's waterfront. 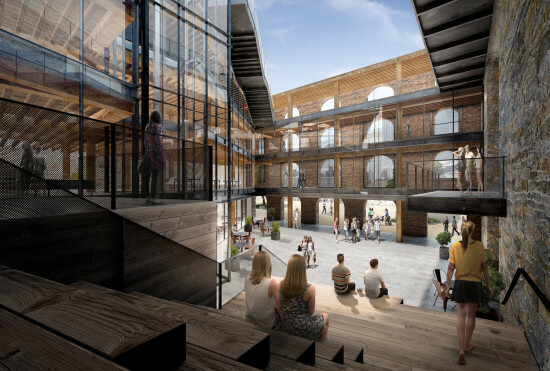 “What we’re looking at creating is something that is not only unique to the history of these remarkable buildings, but also speaks to the culture of the neighborhood and this community,” said Jay Valgora, the founder of Studio V Architecture, the firm that is overseeing the transformation. With this type of project, the first task was to secure the building and bring it up to code. That meant laying a new floor, creating a new foundation, and repointing the massive nearly three-foot-thick masonry walls. There is also the issue of resiliency. The complex, which is actually seven buildings, sits right next to the East River and took in about seven feet of water during Sandy. Since the building couldn’t be lifted or moved, the most practical solution, explained Valgora, was to fabricate an "aqua fence" that could be stored in a nearby warehouse and deployed before of a storm. The idea is that there will be enough lead time to get everything in place. Valgora said the main challenge of this project was to bring light and air into a structure that was built to block out both—the warehouse doesn't even have windows, but rather arched openings and shutters. The firm wanted to create that type of sleek, airy space, while preserving the building's history. Along with new glass stairways, and a glass and steel rooftop addition, the firm is preserving much of the Empire Stores' masonry, yellow pine beams, and schist walls. Studio V's plan to cut an open-air courtyard into the center of the structure is designed to meet both needs of the project: create a light-filled, modern space while showing-off the structure's original details. “We’re going to create a public passage throughthe entire building that reveals and shows the nature of how it was made, as well that brings you into the 21st Century as you go to this rooftop park," said Valgora. As for the windows, the firm is installing large square panels that sit behind the arched frames to preserve the feel of the original facade. 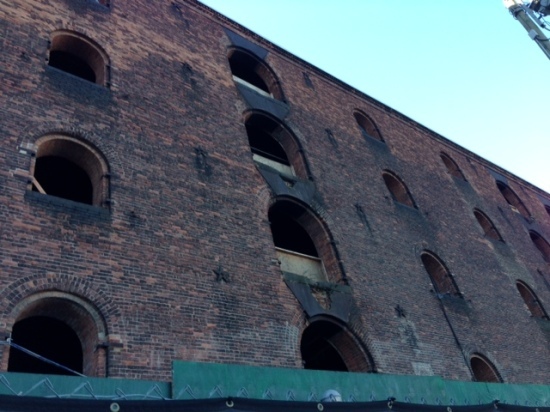 No additional openings are being cut into the structure and shutters are either being restored or replicated. 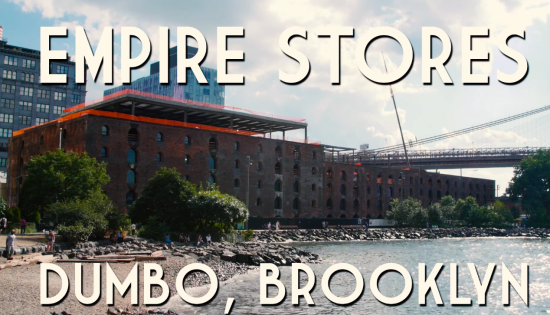 The Empire Stores is one of the development sites along the Brooklyn Bridge Park that has been leased to fund its maintenance costs. For those heading north on the New York State Thruway, the Yonkers Raceway emerging on the right is just another part of the landscape. But Studio V Architects is about to change all that with their massive porte-cochère that serves as the iconic tour de force for the $45 million expansion of the Empire City Casino. 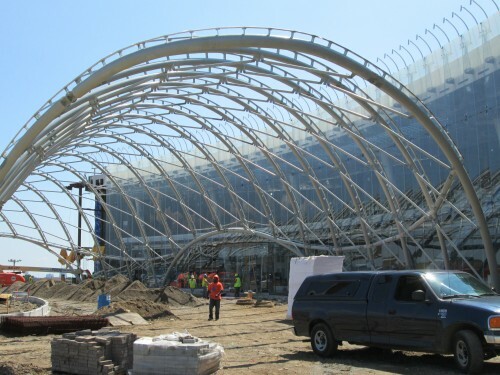 The curved lattice canopy will be clad in ETFE foil—a polymer membrane often used for roofing—that will reflect LED lights resting atop the steel frame. Behind the canopy, a four-story, 300-foot-long glass wall will serve as a clear backdrop to the canopy, mimicking its curve, while allowing visitors to see the action inside. "The sculptural steel and foil shell grow out of the landscape," explained Studio V founder and principal Jay Valgora. That landscape will eventually get the Ken Smith treatment. AN took a trip up to Yonkers to check out the construction and all seems on track for opening this fall. We'll keep you updated on its progress and more from Studio V.